I wasn’t planning on making anything special for Red Nose Day, but Maltesers were giving a fiver to Comic Relief if you baked something red with Maltesers on it and tweeted a picture. I have made a chocolate malt cake before, courtesy of the Hummingbird Bakery’s Home Sweet Home, but it was a three-sponger with extra chocolate fudge sauce and, given that I was going to be assisted in the kitchen again, I was going to have to make something simpler. Something like cupcakes. When you’re making cupcakes, the best recipe will be from the Hummingbird Bakery. There isn’t anywhere else a sensible baker would go. I used a recipe for chocolate cupcakes from Home Sweet Home, and added some Horlicks powder as well as cocoa for the flavouring. I think I might be getting a bit ahead of myself here so, back to the beginning. I mixed softened butter, plain flour, caster sugar, cocoa powder, Horlicks, baking powder and salt in the KitchenAid while my trusty lieutenant in the egg-breaking department (Naomi (3)) successfully cracked two eggs into a jug and mixed them very vigorously with milk. She’s not too keen on the KitchenAid (understandably) so she disappeared while I poured half of the liquid into the dry ingredients and mixed on slow until everything was mixed together. I cranked up the speed a bit (my KitchenAid still can’t go above level six without threatening to leap off the work surface) until I had a smooth batter, and then turned the speed down again and added the rest of the liquid. I used a tablespoon to divide the mixture between twelve paper cases. The advice in Home Sweet Home is to use a 50ml ice cream scoop. I don’t have one and I’m not going to buy one. The only time I’d use it would be to fill cupcake cases, and I’ve only made cupcakes three times in two years. If I’d overfilled the cases, and there was a high chance that I had, I’d have to live with it. I baked the cakes at 150°C fan for 25 minutes. At 20 minutes they weren’t bouncing back when I touched them, so I gave them the full 25 as per the recipe. I was right about over-filling the cases. My cakes needed a trim before the frosting went on. I let them cool down and tidied them up. There were enough off-cuts to keep me going until dinner and beyond. I wasn’t complaining. The big three-sponge chocolate malt cake in Home Sweet Home uses a cream cheese frosting that’s enriched with double cream. I decided to go with a plainer version from The Hummingbird Bakery Cookbook. I sifted icing sugar into the bowl of the KitchenAid, added room temperature butter, threw a tea towel over the top to catch the icing sugar cloud burst, and turned it on. Once the butter and sugar were well mixed, I added full fat cream cheese, held on to the mixing bowl (my mixer has been known to dislodge the bowl at higher speeds) and turned up the speed. At this point I also added some red food colouring. I wouldn’t usually have done this, but my cakes had to be red. I had hoped that a few drops would be enough. They weren’t. It wasn’t a complete surprise though. When I made a red velvet roulade I used three tubes and still ended up with a brown cake. 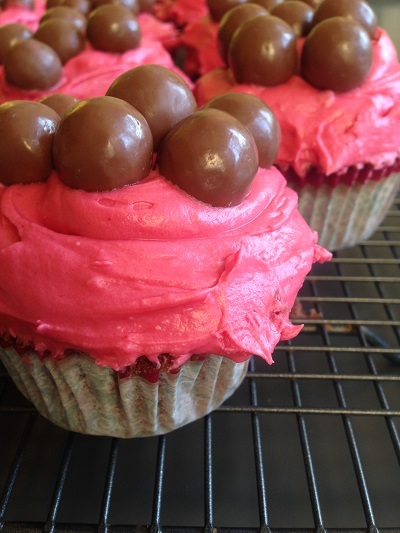 I covered my cupcakes in salmon pink frosting and handed them over to my decorator-in-chief, who gave them a very generous Malteser make-over. They were really good cupcakes, despite the colour. They were chocolatey, maltesery, cream cheesy and just a little bit salty. Salty may sound a bit odd in cupcake language but my husband says that it’s exactly why Hummingbird cupcakes are so good. It’s the salt mixed with all the other lovely sweet stuff. I have to say that I agree. Three batches of cup cakes in my two years of blogging is not enough. There won’t be any more red ones any time soon though.